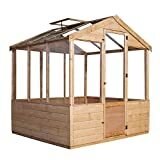 There are certain factors that should be put into consideration while buying a greenhouse. 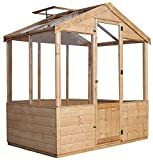 If you need a greenhouse just for growing flowers and herbs, a two tier greenhouse would do good. 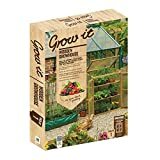 One of the major factors for the growth of plants is sunlight. 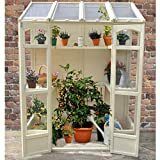 Some plants need half a day of sunlight; sheltered areas are good for the growth of the plants in the greenhouses but one must make sure that there isn’t too much shade as it may hinder their growth, so greenhouses that let enough light enter inside is important. 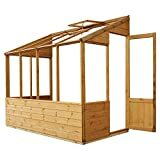 Steel structured greenhouses are a good option as steel is sturdy and light, also capable of blocking strong winds. 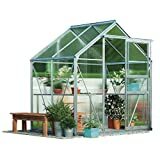 Choose a greenhouse that is constructed from glass and plastic films, the latter being cheaper, but not compatible enough for colder regions. 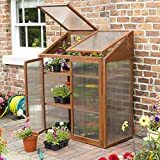 Delivery in 5-7 weeks,UK mainland delivery only .When you purchase this greenhouse you will be contacted by telephone or email before delivery to confirm an exact date. 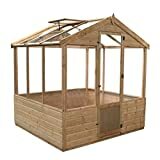 We will post you extra information just after you order, such as a base plan and a list of fitters. 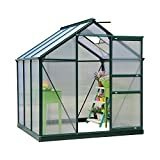 When shopping for greenhouses online, be sure to look for those that are on sale if you want to grab a great bargain given that green houses are usually expensive. There are several stores that choose to offer them at discounted prices for various reason, it is therefore up to you to visit their websites and get yourself a deal.